November 10th was the 528th birthday of Protestant Reformer, Martin Luther. 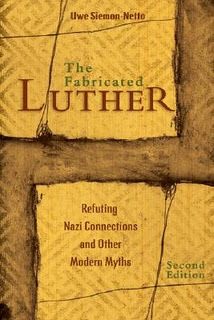 The Lutheran radio show, Issues, Etc., hosted by Todd Wilken, interviewed Uwe Siemon-Netto of the League of Faithful Masks, and author of The Fabricated Luther, about the popular notion that the writings of Martin Luther which were critical of the Jews were in fact part of the source of the twentieth-century Nazi form of anti-Semitism. I will attempt to summarize Siemon-Netto’s explanation and defense of Martin Luther. Some of Martin Luther’s writings from late in his ministry certainly do not match the political-correctness of modern Western civilization, but they are hardly the source of Nazi sentiment against the Jews. For starters, late in his life, Luther was wracked with physical pain and illness, which took a serious toll on him. Psychologically, people under such severe physical and emotional stress are prone to give expression to ideas which they otherwise would not. Luther’s earlier writings were are more affirming and caring, urging the evangelization of the Jews. In sixteenth century Germany, it was still a civil crime to commit blasphemy against the Christian God. Thus, the Jews’ denial of Christ was legally categorized as a violation of German blasphemy laws. While today, Western civilization considers blasphemy laws unjustifiable, we must not judge a man anachronistically when he is seen acting consistent with the context of his own generation. Luther’s statements critical of the Jews had been, right or wrong, suppressed by the Lutheran church due to their recognition that they reflect something other than theologically Lutheran attitude. These writings were recovered and misused by proponents of the Volkisch movement which promoted pre-Christian pagan ethnocentricity and Romantic nationalism, among other influences. Their racist views are projected back onto Luther and unjustly point to him as a primogenitor of their own views when they were actually engaging in public relations to popularize their own peculiar views. C) Luther was fallible, and made egregious mistakes—an admission made by Martin Luther probably more than anyone else. You can hear the entire interview at this link.